The world's greatest video game character returns. Can you believe that it's been over 18 years since history's greatest fighting game - otherwise known as Shaq Fu - hit store shelves? I probably don't need to remind you all how fantastic that game was, or how it ruined gaming for millions (perhaps billions) of gamers by putting every other title in the history of gaming to shame. 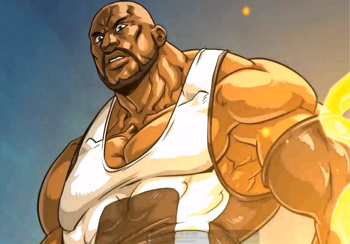 Now, for the first time in almost two decades, Shaq returns as the star of yet another groundbreaking title sure to be a Game of The Year contendor for each of the next 50 years: ShaqDown, for iOS and Android devices. In ShaqDown, you do two things: Run and murder zombies. The action is presented in a two-dimensional sidescrolling manner, and your attacks range from brutal melee moves to Shaq's already well-documented ability to shoot lasers from his hands. I know this sounds like the greatest game in the world, but wait, there's more! In ShaqDown, it turns out that Shaq is actually mankind's savior, which is something I've been telling people since 1994 when I first played Shaq Fu. In fact, I see ShaqDown as more of a prediction of the very near future than a mere videogame. We must heed this game's warning and realize that Shaq, and only Shaq, can save our race from utter destruction. If you want to take ShaqDown for a spin, the privilege will cost you $0.99 on both Google Play and the App Store.